Fiction-Food Café: "The Original Frozen Banana" from "Arrested Development"
"The Original Frozen Banana" from "Arrested Development"
Chocolate covered bananas are something from my childhood and I was reminded of them while watching the recent season of "Arrested Development" on Netflix. B & I watched the heck out of that thing the weekend it came out but sadly the banana stand was gone except for an image in a mural in Pheonix. I still wanted to make this treat all the same and it's perfect for the summer weather! The easy-peasy version of chocolate covered bananas is simply frozen bananas on a stick dipped in melted chocolate chips, chopped nuts optional. 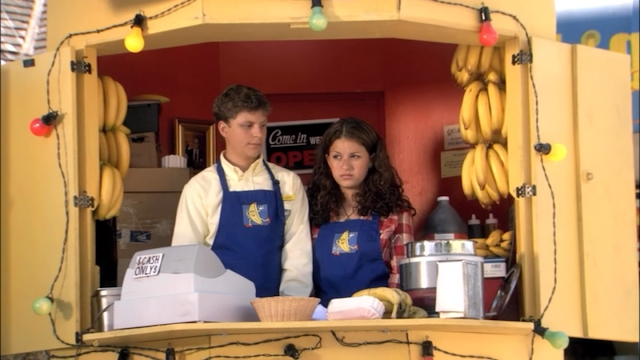 In the show however, the frozen bananas are dipped in hot fudge (the banana stand menu says "fudge" & you can see the fudge in a slow cooker on the counter of the banana stand). 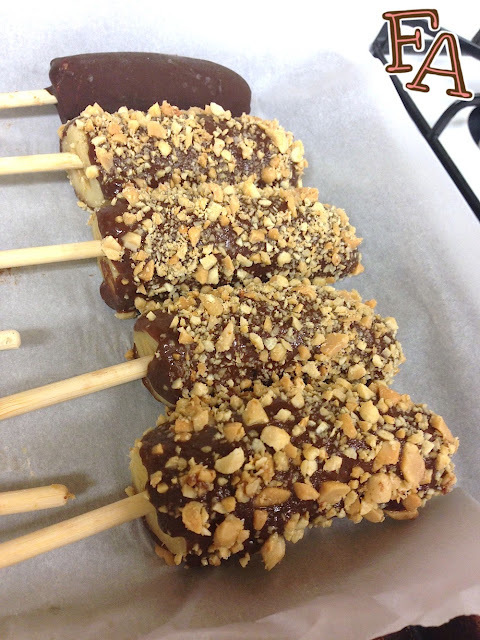 Sooooo, the recipe below is for fudge dipped bananas! Note: Directly below you'll find the official (from the show) banana stand menu. I chose to go for the "Original Frozen Banana" but you can definitely try any of the others! 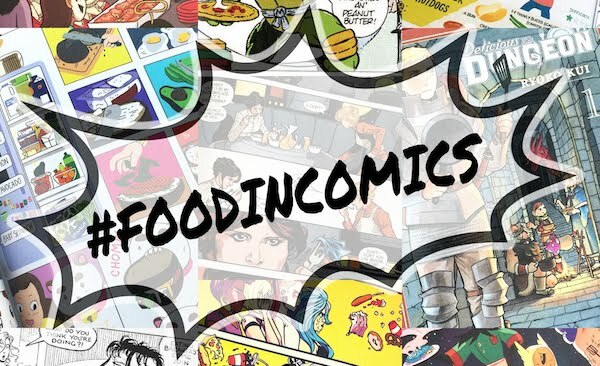 Link pictures in the comments if you do! The Original Frozen Banana: Frozen banana dipped in hot fudge & covered w/ nuts. The George Daddy: Frozen fudge dipped banana sandwiched between chocolate grahams. The G.O.B. 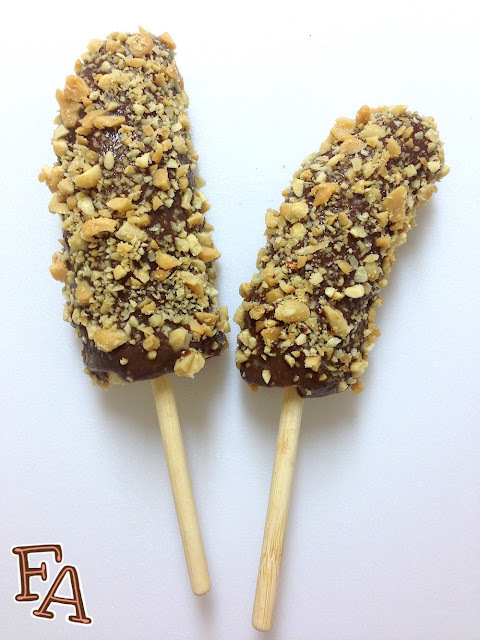 : Frozen banana double dipped in fudge w/ double the nuts (on 2 sticks). The On the Go-Go Banana: Frozen banana in cup of sizzling hot fudge. The Giddy-Girly Banana: Frozen banana dipped in hot fudge & covered w/ pink heart candy. The Simple Simon: Single fudge dipped frozen banana. Double Dipped Frozen: Double fudge dipped frozen banana. If you have THESE paper hot dog trays, all the more authentic! But not necessary. 1. Peel the bananas & cut each one into two pieces. Gripping a banana half in one hand to keep it from breaking, gently slide a wooden popsicle stick into the cut end. Do NOT slide it in so far that it breaks through the top! Continue with each half until all are sticked & then lay them on a parchment lined tray & put them in the freezer for at least 30 mins. 2. Melt the butter & chocolate chips in a pan over medium heat, stirring w/ a whisk. Add the evaporated milk & powdered sugar & bring the mixture to a boil, whisking constantly. 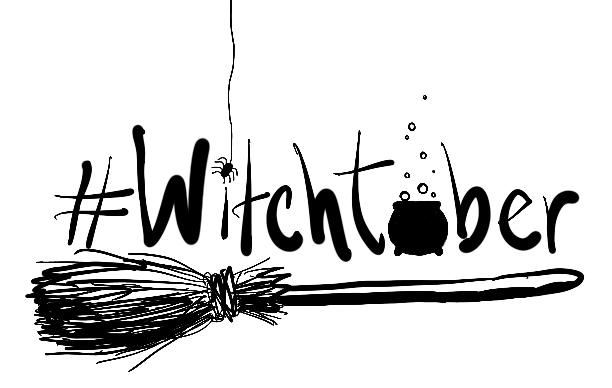 Let boil for about 5 mins or so, whisking & letting it thicken & darken. Remove from heat & stir in the vanilla until completely combined. Let cool for a few minutes. 3. Lay your crushed peanuts on a plate for easy rolling & remove the tray of bananas from the freezer. Having a spoon handy to help with the coating, dip one banana at a time into the fudge. Let the excess chocolate fall back into the pot & give a few seconds for the fudge to cool a bit more on the banana. 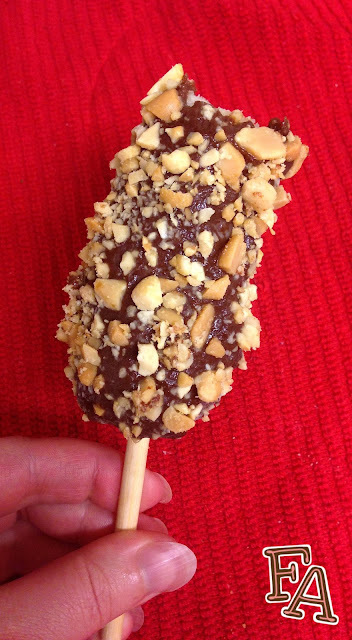 Lay the fudge banana on the plate of crushed nuts & gently roll it until fully coated. Press nuts on by hand as needed. 4. Return the covered bananas to the parchment lined tray & freeze again OR eat right away! (Do NOT leave the bananas out for long if you're not eating them because they will get soft & mushy & gross!) Extra fudge does not need to be refrigerated if you're going to eat it within a week or so, but it can be put it the freezer if you'll not touch it for longer. Simply put it in a plastic container.